Simhada Mari Sainya was directed by Rajendra Singh Babu and co-starred Amrish Puri, Master Bhanuprakash and Master B. R. Prasanna. Film tells the story of a group of children going into the deep forest to fight the antagonist and rescue daughters of their teachers. Gentleman was directed by Shankar and co-starred Madhoo, Goundamani, Charan Raj, Subhashri and Senthil. Film was made with budget of INR 5 Crores and earned INR 22 Crores at box office. Due to its commercial success it was remade in Bollywood as The Gentleman. Film tells the story of jewelry thief and sincere police officer chasing this mastermind. Jai Hind was directed by Arjun and co-starred Ranjitha, Goundamani, Manorama and Senthil. Film tells the story of young man chasing the terrorist group. Group of terrorists attacks Tamil Nadu and kills chief minister and brother of hero. In order to take revenge and save people he goes in to forest with his girl friend to find the terrorists. Karnaa was directed by Selva and co-starred Ranjitha, Vineetha, Goundamani, Senthil and Ravichandran. Film tells the story of young carefree man who was sent by his father to work in Ooty. There he falls in love with sister of antagonists who disapprove their marriage because he is son of police officer and they are criminals. Subsequently a lawyers comes into picture who looks exactly like hero, his father abandoned him because of his physical disability. Rest of story is how the family unites. 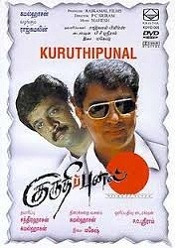 Kuruthipunal was directed by P. C. Sreeram and co-starred Kamal Haasan, Nassar, Gouthami and Geetha. Film was remake of Bollywood hit Drohkaal. Film tells the story of two young police officers who are designing a plan to avert terrorist attacks. They plan to send two police officers in disguise into terrorist group and get spy information but they were caught and commit suicide to avoid torture. Rest of the story is how they prevent chief minister assassination and bring down terrorists. Rhythm was directed by Vasanth and co-starred Meena, Jyothika and Ramesh Arvind. Film tells the story of editor of newspaper and bank employee falling in love. They become friends after he visiting bank to open bank account. She doesn’t talk to him initially but later she likes his attitude and become friends. But in the past his wife died in train accident and coincidentally bank employee’s husband also dies. Rest of the story is how they get together after few misunderstandings. Hanuman Junction was directed by M. Raja and co-starred Jagapati Babu, Sneha, Laya, Vijayalakshmi and Venu Thottempudi. Film tells the story of two young friends starting successful business. They have a sister who is in love with a guy but hesitates to go ahead because of her respect for her two brothers. Her lover joins their company as employee but his main object is to find suitable brides for his girl friend’s brothers. Sri Manjunatha was directed by K. Raghavendra Rao and co-starred Chiranjeevi, Meena and Soundarya. Film tells the story of young atheist who never follow the old aged principles of elders. He shows disrespect to god and those who believes in idol worshiping. But later hero changes his mind and becomes an ardent devote. Lord Shiva himself comes to see his beloved devotee and hero without knowing him rejects to give food unless he takes bath. Rest of story is how he pleases Lord Shiva and feeds god with his own hand. Ezhumalai was directed by Arjun Sarja and co-starred Simran Bagga, Mumtaj, Gajala, Vijayakumar and Ashish Vidhyarthi. It was a remake of Telugu super hit Narasimha Naidu. Film tells the story of two village heads fighting very frequently. Once they decide to end their enmity and select one man from each village as security for watching village. Hero runs a ashram where he teaches classical dance to students. He falls in love with a girl of other village and this creates controversy between two villages , rest of the story is how this love story ends amidst clashes of village. Giri was directed by Sundar C and co-starred Reema Sen, Ramya, Devayani, Vadivelu and Prakash Raj. Film tells the story of two village head hating each other for decades. The reason is death of one family member and blame was put on the other family, to take revenge they decide to kill son of village head but he is saved and disappeared for 20 years. Rest of the story is how he takes revenge for injustice done to his family. Marudhamalai was directed by Suraj and co-starred Vadivelu, Nila, Lal and Nassar. Film tells the story of young police constable working under the comedian senior police officer. Due to his senior’s mistake hero loses his a convict while taking him to court. As punishment his senior makes him to work in his house and there he falls in love with a girl. Later local don was arrested by him and he was promoted for his bravery. Local goons oppose conducting of election for many years but this time due to his bravery he succeeds in defeating the antagonists. Rama Rama Krishna Krishna was directed by Srivas and co-starred Ram, Priya Anand, Bindu Madhavi, Gracy Singh and Vineet Kumar. Film was made with budget of INR19 crores and earned INR27 crores at box office. Film tells the story of young underworld don who left the mafia after his wife was killed by the opposite gang. He has two sisters and now settles in a small village with new identity. But there also they couldn’t live a happily life and was disturbed by the rival gangster. Mankatha was directed by Venkat prabhu and co-starred Ajith Kumar, Trisha Krishnan, Lakshmi Rai, Andrea Jeremiah, Anjali and Premji Amaren. Film was made with budget of INR400 million and earned INR1.30 billion at box office. Film tells the story of group of people running behind illegal amount of INR5 billion planning to be used for IPL betting. Corrupt assistant police commissioner forms his own gang and fixes share for each one. At the same time new firebrand police officer comes to investigate IPL betting scams. Rest of the story is how group loses trust in each other and the game played by corrupt officer.